This story, recipe, and photos was first published at ChefTalk.com. To view it there please click here. It's 8:15 on a chilly November morning and I'm standing in a large empty kitchen stirring flour, yeast, and water in a small bowl and feeling a little stressed. I'm also thinking of my mother. She, of course, is not the reason I am feeling stressed; it's because of the busy day ahead of me. Though my mother has been gone for many years the thought of her still comforts me. The recipe that I'm making—kuchen, or German coffee cake—is hers, and this is the reason I think of her at this moment. 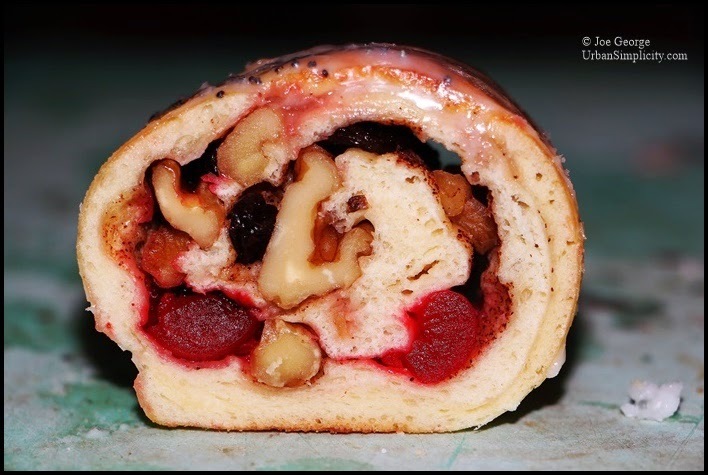 Whenever I make this recipe I also cannot help but think of Christmastime; this is the traditional time to eat this pastry, at least it was and still is in our family. And when I think of the Christmases of my youth I remember them through rose colored almost Rockwellian glasses. We were poor, that’s for sure (not that I realized it then), but there was always plenty of food on the table…especially homemade baked goods. My mother was of German decent and grew up on Buffalo’s East Side. She took pride in her baking skills, and even though she had a houseful of kids and worked full time she still managed to bake mountains of cookies and trays of kuchen for the holidays. Kuchen (pronounced kooken) is the German word for cake, and is more closely related to coffee cake than traditional cake or flaky pastry. I’m sure there are as many variations as there are those who make them. This is about the one I grew up with. What’s distinctive about kuchen, or at least this kuchen recipe—opposed to some of the other coffee cakes—is that it’s made with yeast-leavened dough rather than a chemically-leavened batter. And though the dough is rolled flat, filled, and rolled into a log or crescent, it’s not a strudel because strudel utilizes a buttery unleavened flaky dough that more close resembles phyllo. The recipe that I make is one that my mother learned from her mother who learned it from her mother and so on. 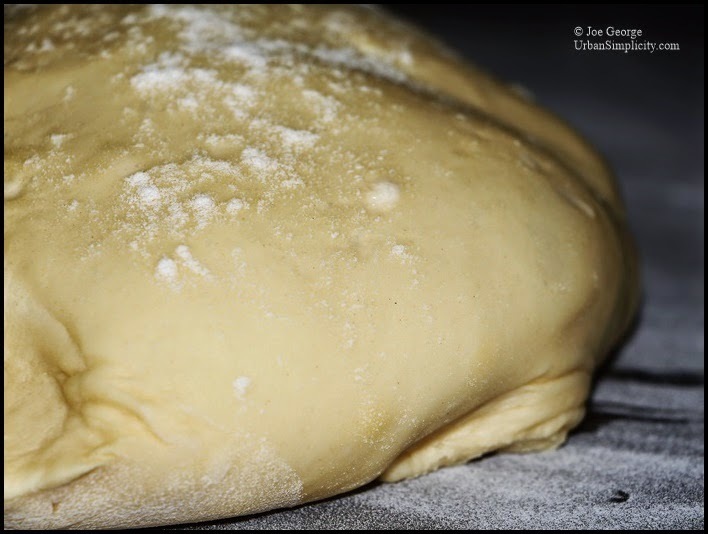 And while I suppose one could say that I learned the recipe through osmosis—absorbing it at my very core while I played in the kitchen as my mother kneaded the dough and the sweet smell of yeast wafted in the air—but that's not how it happened. Years ago I inherited a small notebook that was hand-penned by my grandmother, my mother's mother. 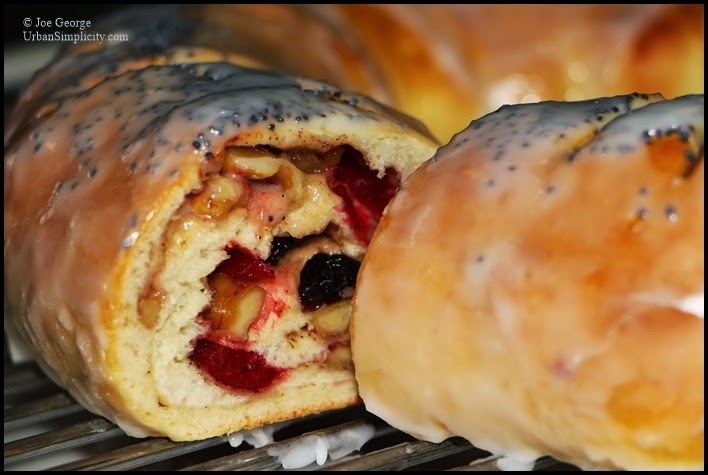 There are only a dozen or so recipes in the slim volume and one of them is for “foundation dough,” which is the basic sweet yeast dough that is used for not only kuchen but also the delectable German doughnuts fastnachts kuekles, which are traditionally eaten on Shrove Tuesday just before Lent. I can still picture the brown terracotta bowls resting on the radiator with towels shrouding the pillow-like dough. I was told not to touch the bowl or leave the kitchen door open too long, lest it become drafty and the dough fall. It was such a mystery, seeming almost magical, how the dough would grow. I can only speculate that this recipe—and being in the kitchen as a child while my mother made it—is in fact the basis for my fascination of yeast-leavened doughs. I tweaked my grandmother's original recipe for foundation dough. The most obvious changes are accurate measurements, meaning rather than a pinch of this or a handful of that I added measured ingredients. I also replaced the shortening in the original recipe with butter. But another less overt change was in the method in which it's made. Rather than using the traditional straight dough method for this—which of course has yielded a delicious kuchen for generations—I incorporated a pre-fermet, or mixing together a portion of the flour with the liquid and yeast and allowing it to ferment prior to mixing the dough. This, in my opinion, offers a dough that is both more supple to knead and also one with a bit more flavor. And I also generally mix the dough in an electric mixer with a dough hook, I can still picture my mother kneading the dough on our flour-covered kitchen table. So this morning after mixing together the pre-ferment, and after the rest of the kitchen staff had arrived, it bubbled away for an hour or so as our day began. Then as the day bustled along I mixed and kneaded the pre-ferment into a dough and it silently rose through the busy lunch hour. Then, a bit later, after rolling the dough flat I filled and shaped it, and then—after letting it rest a bit—baked the kuchen. After it cooled some, I drizzled it with a simple sugar icing. Then I sliced it and offered it to the staff in the calm of the afternoon that follows a busy lunch. It is said that the sense of smell and taste are the two most powerful memory senses. And on this day—while standing in the midst of a bustling commercial kitchen lined with stainless steel—when I bit in I was still just that little kid in my mother's tiny home kitchen in a public housing project with steamed up windows...and I was full of anticipation because I knew that Christmas was just around the corner. To make the dough, combine the water, milk, sugar, yeast, and two cups of flour in a large bowl. Allow to rest for 1 hour, or until the yeast is fully active. Transfer to an upright mixing bowl with a dough hook. Add the eggs, melted butter, salt, and 4 cups of flour. Run the mixer on low for 1 minute (if the dough seems too sticky add the remaining cup flour) then turn to medium and knead for 5 minutes. Transfer to a lightly oiled bowl, cover and let rest at room temperature for about an hour, or until double in size. Preheat an oven to 350F. Transfer the dough to a floured work surface and cut into three pieces. Shape into balls, cover and let rest 20 minutes. Roll into large ovals about 1/4 inch thick. Brush with melted butter and sprinkle liberally with sugar and cinnamon. 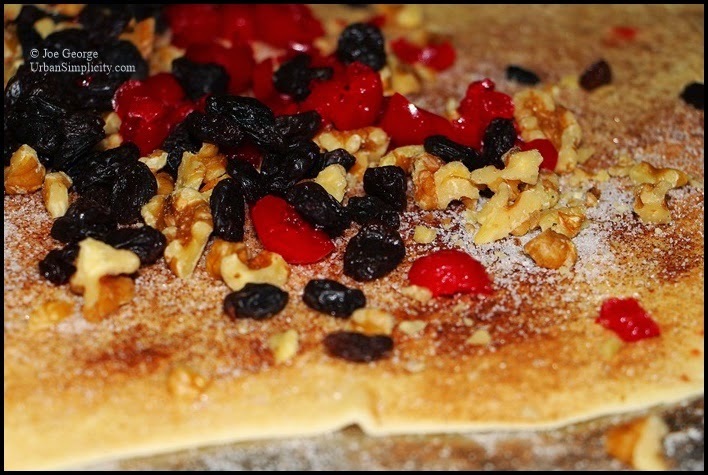 Sprinkle with cherries, raisis, and walnuts. Roll into logs then shape into crescents. Transfer to baking sheets lined with oiled parchment. 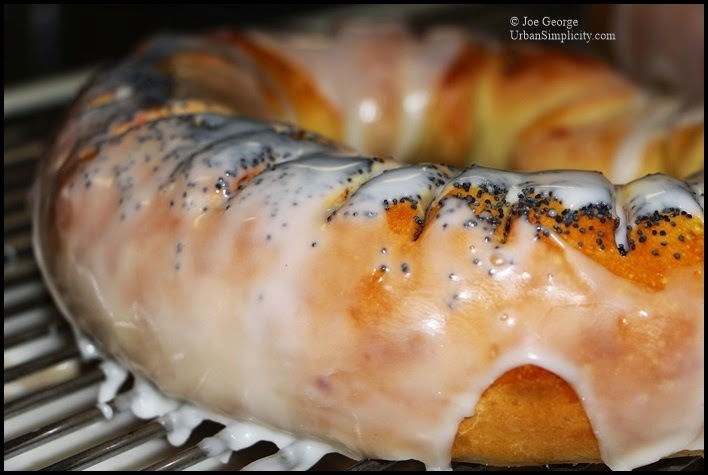 Brush the with the egg/milk mixture and sprinkle with poppy seeds. 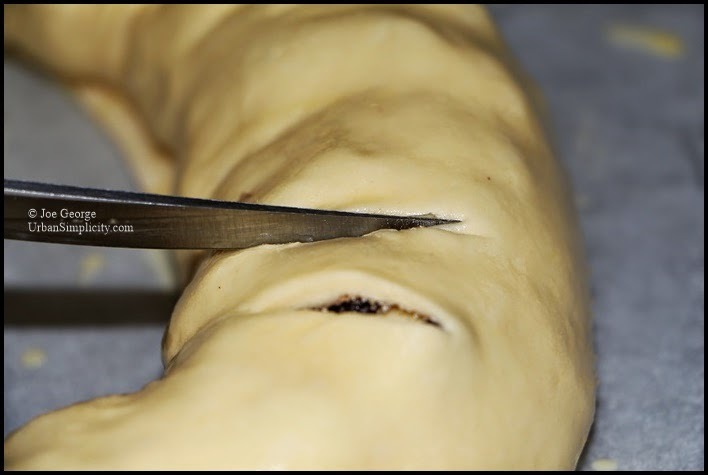 Make small slices about every two inches. Bake for 20-30 minutes, or until a skewer pulls out clean. Transfer to a wire rack and cool 15 minutes. Mix powdered sugar with just enough milk to make an icing the consistency of heavy cream. Drizzle over the kuchen and let dry for 15 minutes before slicing.